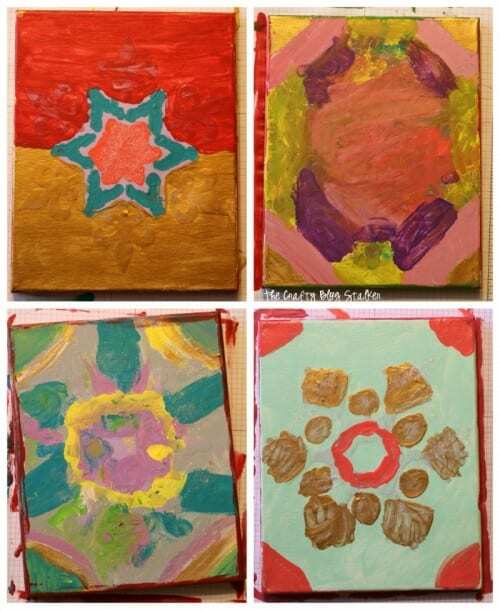 Make memories and create a fun and messy finger painted snowflake canvas. 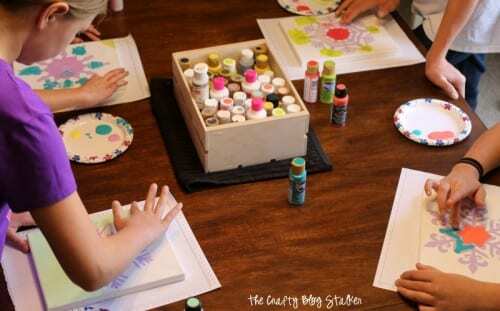 A fun craft for kids of all ages! An easy DIY tutorial idea. As you can probably guess from my blog, I love to craft and do so almost daily. I am so focused on creating content for you, my reader, that I sometimes forget to get everyone in on the fun. So this time I am making sure to get everyone involved and make fun (and messy) family memories. My sweet little kiddos aren’t so little anymore. In fact, the oldest can start driving in February! 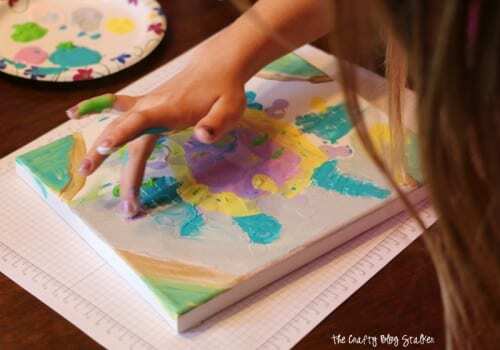 Even though they may be older, it doesn’t mean they are too old for fun and messy crafts like finger painting. It just means that they are old enough to clean themselves up. I definitely don’t miss bath time with four little kids. 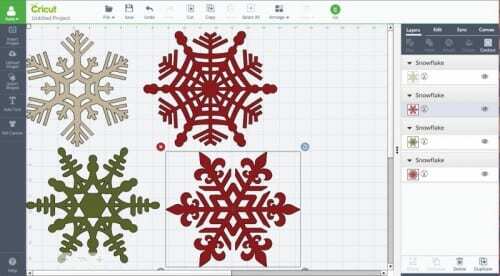 Using my Cricut, I cut four different snowflakes out of vinyl. The snowflakes came from the Teresa Collins – December 25th collection. 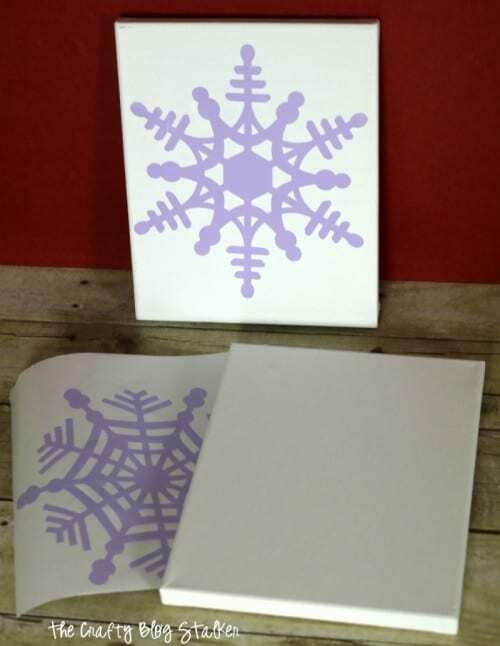 Carefully remove the vinyl snowflakes from the paper backing and center on the front of the canvas. and let them finger paint however they wanted. I gave them two rules, 1. no paint brushes and 2. you can’t clean up until you are completely finished. 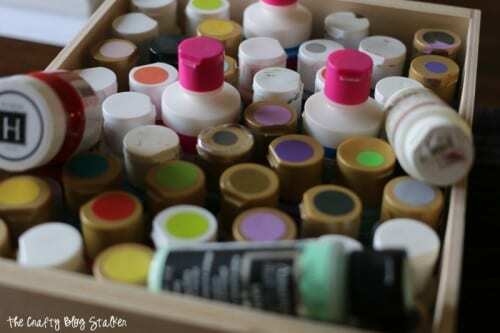 They started very delicately, it has been years since they had finger painted. 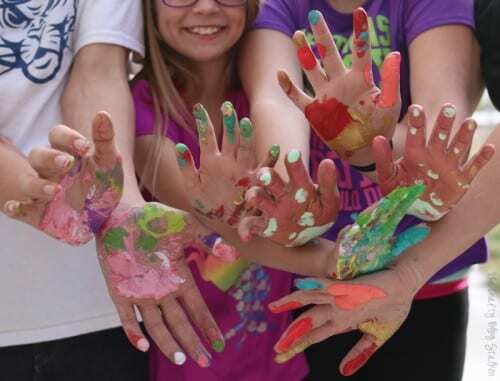 It was so much fun to watch them get into it, and the more fun they had with it, of course, the more paint they got on themselves and the canvases. When everyone was done we did a group shot of just the messy hands. 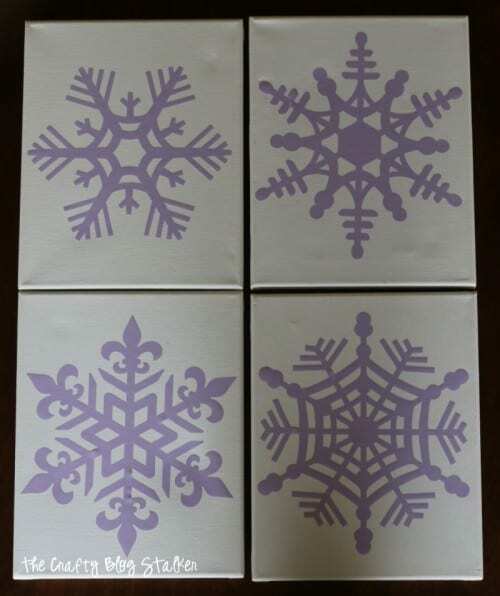 The vinyl snowflakes were used as giant stickers, so when it is removed the canvas underneath will remain white while everywhere else is covered in paint. 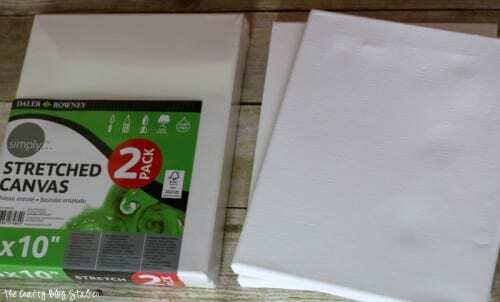 Here are the canvases completely painted while they are waiting to dry. After a couple showers to clean up, they were dry and so the vinyl stickers were removed and the awesome works of art were revealed. 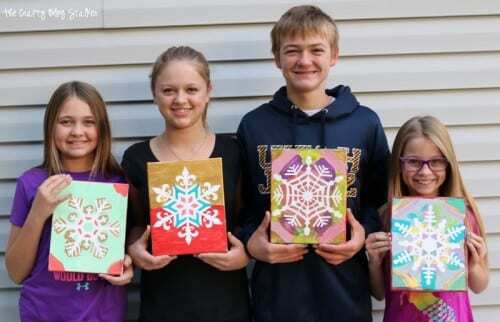 I love how proud they each were of their masterpieces. It did remind me of doing similar activities with them when they were only toddlers. We need to do this more often! 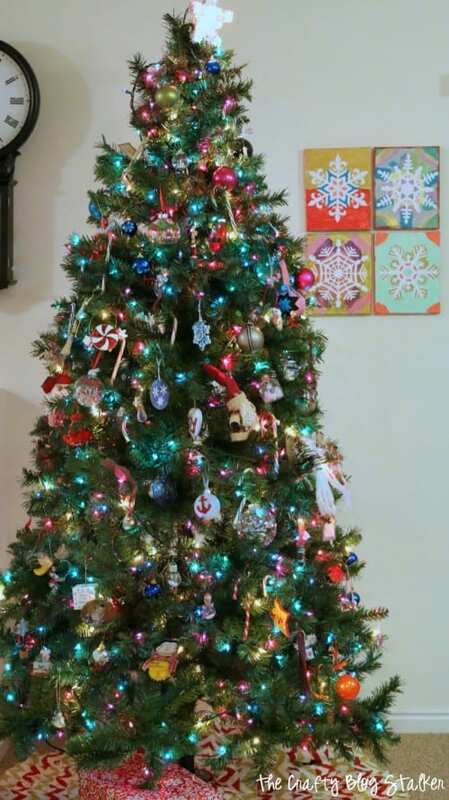 The handpainted masterpieces were hung by the Christmas Tree for all to see. They can now be brought out every year with the decorations and we’ll remember the time we had fun painting with our fingers. What are some of your favorite holiday traditions? Share and leave a comment below. 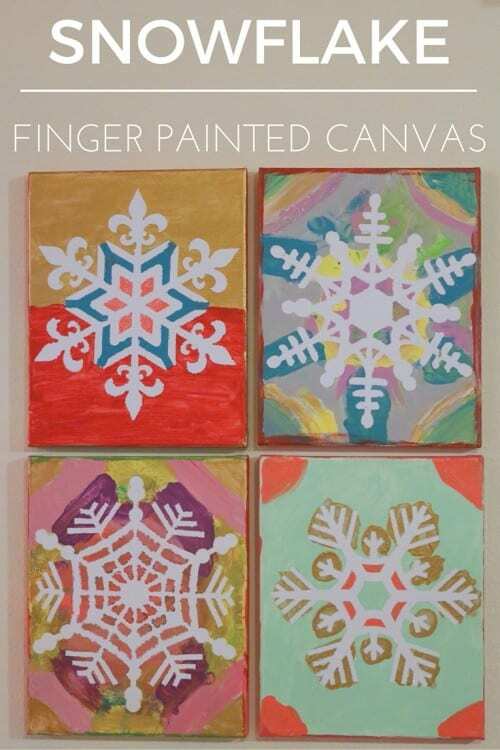 SAVE HOW TO MAKE A SNOWFLAKE FINGER PAINTED CANVAS TO YOUR FAVORITE DIY PINTEREST BOARD! What a fun idea! Thanks for sharing with us at the Funtastic Friday Blog Hop! Thank you Debra! 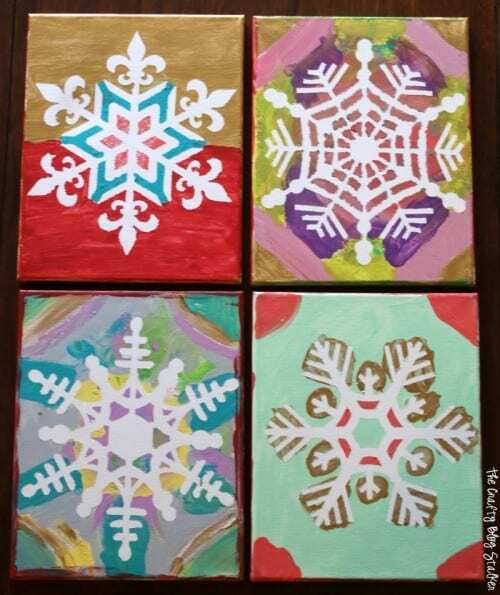 I am so glad that you like these Finger Painted Snowflakes!